Looking for the BEST Pinterest Marketing Strategies? Join my insider’s tour of Pinterest and learn the top Pinterest marketing strategies from inside Pinterest headquarters in San Francisco. I had the incredible experience of getting an invitation to interview a Partner Manager and tour Pinterest headquarters in San Francisco, California. I was only slightly geeking out at the sign of the Pinterest logo outside the building in the tech center of San Francisco (LinkedIn, Brit+Co, and former Twitter headquarters are all nearby). Beyond the fridges full of La Croix, cold brewed coffee, and snacks galore, the headquarters displayed an open space work atmospheres (no offices or cubicles here!). a Partner Manager at Pinterest headquarters who works with large Fortune 500 brands on their promoted pin strategy, was gracious enough to sit down with me and let me pick her brain about the best Pinterest marketing strategies, promoted pins, and the future of Pinterest. Much of what I discussed with her wasn’t a huge surprise. In fact, it was really validating to hear that the techniques I use to grow my clients’ presence and drive traffic are the same techniques Pinterest recommends for their own clients. She specializes in promoted pins at Pinterest, which is another name for their paid ads. Ads are somewhat new to Pinterest and although they hope to increase their use on Pinterest as a whole, they will never completely replace the organic pins that we know and love which make Pinterest a unique platform. “Organic virality” is the term that Pinterest partners use to describe the perfect formula for a pin to go viral on its own. With over 1 billion searches on Pinterest a month, a few key features can help a pin achieve virality and take off! Vertical images—make sure your images are vertical, not square. Unlike Instagram, Pinterest prefers and recommends 1000×1500 px (which is basically a 2:3 ratio). Good quality images—images need to be really good quality. Grab a digital camera (see my blogging resources for my favorites) to create images of your product/service or stock photography (my best tips for stock photography are here and my favorite stock photos libraries are Pax Stock or Twigy Posts). She recommended using a text overlay with your images—they tend to drive more click throughs than images without text. A strong keyworded call-to-action (CTA) in your pin description—Pinterest is a search engine and discovers pins through keywords in the pin description. This is your most powerful tool for getting organic virality and a powerful Pinterest marketing strategy. I discuss a lot about keywords in this post, but the drive-home point from her was to make sure that there was a strong CTA in the first three lines of the keyword description in a conversational style (“how to”, top x tip) that invites the pinner to click through. Another new and novel idea is to use hashtags (I know, conventional Pinterest wisdom has always said no to this, but platforms change and evolve). I explain more on using hashtags below. A Pinterest worthy moment at the entrance: A Farmgirl Flowers delivery! I plan to do a separate post on promoted pins (and some other tips I received), but since she works with promoting big brands on Pinterest, I listened closely. 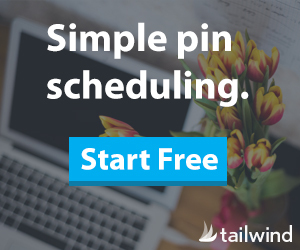 Promoted Pins are a powerful way to introduce your pin to a selected target audience through keywords (yep, keywords again!). One thing I love about Promoted Pins is that they can be saved just like any other pin. Once they are saved and perhaps even achieve “organic virality,” the advertiser gets free promotion. You only pay for the original pin, but if it takes off, each pin after that is free. It pays to advertise on Pinterest! Another unique and new change to Promoted Pins is video. We all know that video content is king and it is no different on Pinterest. She recommends creating videos that have “sight, sound, and motion.” Showcase your product in a 1:1 ratio, give a quick teaser about how to use it or display it, or perhaps do a food or craft tutorial à la Pinterest style to draw the user in! This can be important for brand awareness or even driving traffic (remember to use strong CTAs in that pin description or text overlay like “learn more”). What platform isn’t constantly evolving? Pinterest is no different! One huge change to Pinterest is the use of hashtags. She explained that brands really wanted to utilize hashtags because they had become so commonplace on other platforms and basically the language of #marketing. Pinterest has started utilizing hashtags in the search as well as linking pins with the same hashtags. Her Pinterest marketing strategy was to include at least one hashtag after the end of the pin description that most strongly represented the purpose of the pin. For example, for this post on Pinterest I might use #pinterestmarketing. Use your Yoast keyword or keyword planner tool to choose a hashtag and include it in your pin description. Pinterest still remains my favorite platform, and the Pinterest headquarters is passionate about growing their platform and supporting small businesses. With these Pinterest marketing strategies, you’ll be on your way to “organic virality,” growing in brand awareness, and driving traffic to your site. Don’t forget to PIN the image below if you found it helpful! So jealous! I would love to go to Pinterest HQ. This was a great post filled with some great tips. I was surprised to hear about the hashtag strategy. Everything I have read about Pinterest says a big fat NO to hashtags. Did she give any insight into how many hashtags you should use? Thanks! It’s been ‘no to hashtags’ for a long time, but hashtags have become a universal language of social media, so Pinterest started using them (because brands were pressuring). She recommended 1-2 hashtags following your keyword description. 🙂 Hope that helps! How I would love to tour Pinterest! What a wonderful opportunity for you to see the nuts and bolts behind the pretty pins. I just love your tips and I can’t wait to give hashtags a try. I am really hoping they are what I need to get my pins in front of more eyes. Thanks so much for sharing. What a cool visit. I will have to start adding in hashtags now. And, this is good news because it actually solves one of the dilemmas/questions I’ve had over the last week or so, so thank you, thank you, thank you. Omg! How lucky to have visited their offices. I would love that! Thank you soon much for writing this article. I had no idea about Call of action on description. Pinterest is by far the platform that brings most of my customers to my site (behind organic google searching). I learned something new reading your post so thank you!